Animal sacrifice and man’s relation to meat has preoccupied some of China’s greatest thinkers since ancient times, as seen in Mencius’s discourse with King Xuan of Qi, who, upon seeing a terrified ox about to be ritually sacrificed, orders it to be replaced with a lamb. Mencius, also known as Master Meng, tells the king that his natural compassion upon seeing the frightened animal rendered him fit to rule as a true king. This article concerns a time and place centuries apart from Master Meng and King Xuan, and approaches the seemingly simple question of who, in the few counties under study, provided animals for imperial sacrifices. I posit that local Muslim communities’ participation in state sacrifices gave them a particular kind of cultural and social agency in a society whose religious norms rendered them a minority. Northern Sichuan, a region of sinewy, mountainous roads that the Tang poet Li Bai once said were harder to traverse than “scaling the blue sky,” is home to a chain of charmingly well-preserved old towns that align with the course of the Jialing River. The Jialing and its tributaries are formed by the merger of two river sources from Gansu and Shaanxi in northwestern China, from where it flows south until it meets the Yangtze River at Ba County, or modern-day Chongqing. Langzhong, where I lived for sixteen months during my doctoral archival research and fieldwork, is one such picturesque old city, surrounded by the Jialing on three sides. 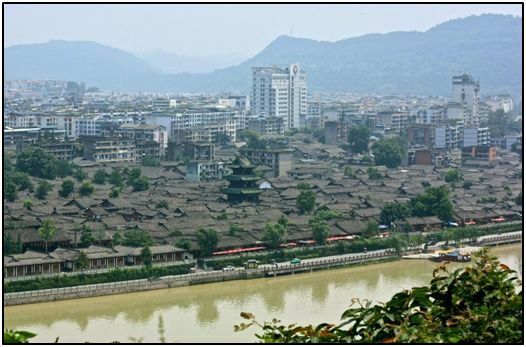 Like many of the trading port towns along the river, Langzhong is home to a small Muslim population, which arrived during the last dynasty of imperial China, the Qing (1636-1912). Resembling a smaller version of the famed Muslim quarter of Xi’an in Shaanxi Province, the Muslim community here lives in a discreet corner of the ancient town along and around the winding alleys of “Mosque Street,” from which local Muslim shopkeepers sell cured meats and local sweets—many of which have become representative, well-known “local bites” of the wider region. One such food item is called “Zhang Fei Beef,” which is now sold nationally across China as a Sichuan provincial specialty. Invented in Langzhong by a pair of Muslim brothers surnamed Wang during the Qianlong Reign (1735-1796) and previously known as “Baoning Dried Beef,” the beef was noted by foreign missionaries in the late nineteenth and early twentieth centuries as being the most notable of Langzhong’s local culinary products and among the only non-vegetarian options available to locals. Zhang Fei refers to the butcher and military general under the command of Liu Bei during the Three Kingdoms Era (220-280), whose tomb rests at the center of Langzhong’s old town. Across China, the figure of Zhang Fei often appears with Liu Bei and Guan Yu in temples and festivals dedicated to “the Three Righteous Ones.”Yet, Zhang Fei was not as widely celebrated or patronized as his brother-in-arms Guan Yu, and it is largely in Sichuan and Chongqing where his figure often appears alone in temples and shrines. Zhang Fei’s cult only entered Sichuan’s “register of sacrifices” (sidian 祀典) in 1816 after the White Lotus Rebellion, during which time many popular gods, such as Lord Wenchang, were actively promoted by the Qing state. Zhang Fei’s elevation in the state’s ritual order meant that twice a year, at the Spring and Autumn Grand Sacrifices (the Chunji and Qiubao Festivals), the Baoning Prefectural Government would pay for a large number of ritual items (jipin 祭品) to be used as part of its official sacrifices, such as silk, jade, grain, cows, lambs, and pigs, which they did for all the semiannual state-recognized cults celebrated at the prefectural and county levels. Cattle raised [and used] by farmers no one dares slaughter (since they are used for farming), but the Muslims of the town must slaughter cows and lambs. This place does not have a lot of cows and lambs so thus we have to purchase them from a distance. Although pigs are raised by every family, they are still not enough to meet the needs of this locality. Therefore, many merchants buy animals from a place in Wen County, Jiezhou, Gansu Province and export them down along the Baishui River for raising by [our local] butchers. This observation provides some context for the meat industry of late imperial Sichuan. Most of the animals transported into the county came from Gansu Province, the large Muslim communities of which have been thoroughly studied by Jonathan Lipman.James Millward has likewise described the Muslim-dominated wool trade between northern Sichuan’s Songpan and northwest China during the late Qing. Local Muslim communities along the Jialing River and its tributaries potentially controlled some of the animal trade, though further inquiry is needed on that front. Terry Kleeman’s foundational work on the role of meat sacrifices in Chinese religious history poses additional reasons why the writers of Langzhong’s county gazetteer may have specifically mentioned the Muslim community’s role in animal husbandry. According to Kleeman, meat offerings were and “remain the dominant means by which the Chinese people interact with the sacred realm.” Daoism and Buddhism originally rejected blood sacrifice, but the sacrifice of animals was too deeply rooted in local practice and went too high up the state bureaucracy for Daoists or Buddhists to eradicate it; therefore, they had no choice but to find ways of sanctioning it. In ancient China, meat came to be associated with the official class, which was called roushizhe 肉食者 (Ch. “meat eaters”), and the gods, who mirrored the official class, were thereby conceived of as meat-eating. Thus, while ritual animal sacrifice remained important for the state cult and family rituals, most of China’s organized traditional religious communities officially distanced themselves from such blood sacrifices with one notable exception. Muslim communities oversaw the annual ritual slaughter of a sheep, cow, or goat for Eid al-Adha, or “Feast of the Sacrifice,” and were well known for their butchery in many parts of Sichuan. Out of Langzhong’s pre-modern religious groups, regular meat slaughter may have been most closely associated with Muslims, and hence the gazetteer reads “Muslims of the town must [cannot not] slaughter cows and lambs” 城中回民不能不屠牛羊. This attribute worked in two directions: on one hand, Muslims probably suffered discrimination from certain sectors of local society that associated butchery with uncleanliness, yet at the same time, the communities’ noted talent for butchery, in some localities, put them at an important nexus in the practical machinery of the state cult. Where gazetteers are conservative in presenting an ideal “face” of a locality, archival yamen legal cases often provide the earthly details. A legal case from the Ba County, which was located down the river from Langzhong, paints a fuller picture of Chinese state sacrifices. During the Spring Festival of 1900, a group of local Muslim butchers brought a plaint to the county yamen that read, “The Muslims (huimin 回民) Feng Haiyuan, Ma Yusheng, Xu Xingfa, Lai Chunlin, and Zhou Ming are responsible for carrying out the Spring and Autumn Grand Sacrificial Rituals’ cattle arrangements. Now, we are kneeling before the magistrate to report clearly our situation and [seek a] judgment.” The plaint states that it had long been the custom in Ba County for “the ways (teachings) of the Hui (Islam) and the ways of the Han, these two ways, to perform this task (of presenting the animals for the sacrifices)” huihan liangjiao chengban 回漢兩教承辦, with non-Muslims providing the pigs and Muslims providing the cows and lambs. The group explained that they travelled to Nanchuan in order to purchase cattle shipped down the Jialing River from northern Sichuan for the state’s semiannual sacrifices. This may have been part of the same animal trade mentioned in Langzhong’s gazetteer. The plaint continues that on the way back to Ba’s County Town, one of the cows, which was the most corpulent of the bunch, could no longer walk as its foot had become trapped in a rice patty, and so the group rested for the night. When they awoke in the morning to retrieve their cow, they discovered it was stolen and later found that it had already been killed. The Muslims explained to the magistrate that returning to the county seat without all the necessary cows for the sacrifices had embarrassed them. What follows is an important part of their testimony. The primary plaint-bearer, Feng Haiyuan, explained that that since there was a legal statute in the Great Qing Code that said cattle to be used in a state ritual may not be tampered with or killed, the group wished to report the culprit, a man named Zhou Jinshan. But Feng continued by noting that what was even worse was the fact that this criminal had killed the cow in an inappropriate way by not first draining the blood from its body (“first removing the blood and bones;” xianti xuegu 先提血骨). In other words, Feng Haiyuan argued that by ignoring the ritual standards of Islamic law regarding the slaughter of animals (Ar. dhabiha) through the straining of the animal’s blood, the criminal had rendered the meat unclean for presentation to the gods of the imperial cult. Anthropological accounts of the sacrifices, including C.K. Yang’s, have noted that blood was usually offered separately in the rites and independently from the animal carcasses. After reading the plaint, the magistrate summoned Zhou, who denied the charges and accused the group of ill intentions. The magistrate ordered an investigation into the circumstances surrounding the animal’s death and the meat produced from its carcass, but ruled that the Muslim butchers would not be responsible for the lost cow. With the raising of commercial and consumption taxes at the end of the Qing Dynasty, butchery within Muslim communities became a focal point for political and religious questions in a rapidly changing social landscape. 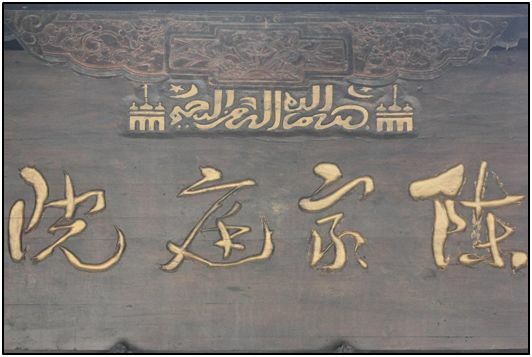 Nanbu County, which is located immediately south of Langzhong, possessed a negligible Muslim community that was largely composed of Langzhong-based families traveling south to sell meat for ritual purposes to the local Nanbu government and various shrines. In spite of its small size, this community is well-represented in the preserved archives of Qing and Republican Nanbu County, which often mention them for precisely these reasons. With the fall of the imperial system in 1912, local governments ceased purchasing animals for ritual purposes, though Muslim communities were permitted to continue slaughtering animals for their own religious needs. In the late 1930s, with the consolidation of KMT rule in Sichuan, provincial officials ruled that the sixteen Sichuan “counties with a Muslim population” were allowed to let local Muslim butchers slaughter cows, while the ten counties without a registered Muslim population were forbidden from slaughtering any animals.According to government documents in the Nanbu’s Republican Archive, there was trepidation among KMT party officials that Communists were using the killing of cows as a method for sabotaging Sichuan’s agricultural output, since oxen were necessary for farm work. From 1938 onward, obtaining a government license became necessary in order to kill any cow. Several corruption cases broke in Sichuan during the 1930s and 1940s when Muslim butchers were caught selling exorbitant amounts of meat for profitable non-religious, non-ritual purposes. Henceforth, dried meat, such as Langzhong’s “Zhang Fei Beef,” was banned, since such meat could not be traced to its original butcher, and only freshly killed meat was allowed to be sold. Though the KMT naturally provided economic and political reasons for their policies, when considering Rebecca Nedostup’s pathbreaking work on the complex enforcement of religious policies under KMT rule in Jiangsu Province, I would not discount the possibility that some local political elites may have considered animal slaughter to be unlucky during turbulent times; during the imperial period, the slaughter of animals was often temporarily forbidden during a drought or natural disaster. Sichuan Province did not possess a particularly large or noteworthy Muslim community during the Qing Dynasty in comparison to Gansu, Shaanxi, Yunnan, or even Henan, but a brief look at local gazetteers and legal documents reveals that the province’s local Muslim communities played significant roles in providing livestock for local Spring and Autumn Grand Sacrifices. This does not explain how pigs were procured for such sacrifices, or how local Muslim religious leaders may have felt about these commercial relationships. Nonetheless, in some places in late imperial China, a local custom of the local minority—in this case, halal butchery—may have become the working local standard of the local majority. By virtue of the economic, social, and religious positions of Muslims within the “cultural nexus” of many late imperial localities, local officials relied upon them and their slaughtering methods to present some livestock and meat for ritual sacrifice. Muslims in imperial China did not necessarily have to worship at the altars of Chinese gods to exert their identities as upstanding local inhabitants, obedient subjects, or agreeable neighbors. As any child brought up on the story of God’s sparing of Ibrahim’s son knows, the followers of any god who pulls his weight in this world or the next are sometimes in need of a lamb or two; lest we forget, the Muslims of Langzhong were well-acquainted with Mencius and Muhammad. The Muslims of Langzhong have invented many local food products that are now standard items for the local area. For instance, the community’s “halal mooncakes” (qingzhen yuebing) are consumed by the entire town during the Mid-Autumn Festival. Zhu Lin, ed., Langzhong zhanggu (Langzhong: The Local Gazetteer Production Office of the People’s Government of Langzhong City, 2013), 216-218. Isabella Lucy Bird, The Yangtze Valley and Beyond: An Account of Journeys in China, Chiefly in the Province of Sze Chuan and among the Man-tze of the Somo Territory (London: J. Murray, 1899), Vol. 2, 1-2. Daniel L. Overmyer, Local Religion in North China in the Twentieth Century: The Structure and Organization of Community Rituals and Beliefs (Leiden: Brill, 2009), 128; Liu Yonghua,Confucian Rituals and Chinese Villagers: Ritual Change and Social Transformation in a Southeastern Chinese Community, 1368-1949 (Leiden: Brill, 2013), 244. Prasenjit Duara, “Superscribing Symbols: The Myth of Guandi, Chinese God of War,” The Journal of Asian Studies 47, 4 (1988): 778-795; Li Yongqi, ed., Langzhong guji (Beijing: Zhongyang wenxian chubanshe, 2009), 110; Tobie Meyer-Fong, What Remains: Coming to Terms with Civil War in 19th Century China(Stanford, CA: Stanford University Press, 2013), 28-30. Daoguang Baoning fuzhi (1821) 26: 20-22. Michael Szonyi, “The Illusion of Standardizing the Gods: The Cult of the Five Emperors in Late Imperial China,” The Journal of Asian Studies 56, 1 (1997): 113-135. Xianfeng Langzhong xianzhi (1851) 3: 34. Jonathan N. Lipman, Familiar Strangers: A History of Muslims in Northwest China (Seattle: University of Washington Press, 1998). James A. Millward, “The Chinese Border Wool Trade of 1880-1937,” The Legacy of Islam in China: An International Symposium in Memory of Joseph F. Fletcher, 1988. Terry F. Kleeman, “Licentious Cults and Bloody Victuals: Sacrifice, Reciprocity, and Violence in Traditional China,” Asia Major (1994): 185. Evelyn S. Rawski, The Last Emperors: A Social History of Qing Imperial Institutions (Berkeley, CA: University of California Press, 1998), 236-240. Michel Strickmann, “The Mao Shan Revelations: Taoism and the Aristocracy,” T’oung Pao (1977): 1-64; Livia Kohn, ed., Daoism Handbook (Leiden: Brill, 2000), Vol. 14; Ma Shanglin,Sichuan huizu lishi yu wenhua (Chengdu: Sichuan minzu chubanshe, 2004); Bernard Faure, The Power of Denial: Buddhism, Purity, and Gender (Princeton, NJ: Princeton University Press, 2009). Ba County Qing Archive: 06-50-39210. For instance, The Great Qing Code, Article 157: 3: “If the animals destined for the great sacrifices as well as the jade, silk, and grain are not in accordance with the rules, [the official] in charge will receive fifty strokes of the light bamboo.” Article 157: 4 “If [while] the animals designated for the great sacrifices, the one in charge of the feeding of the animals does not [proceed] in accordance with the rules, to that they become thin or are injured, for one animal, sentence to forty strokes of the light bamboo. For each [additional] animal, add one degree. The penalty is limited to eighty strokes of the heavy bamboo. If death results, add one degree.” William C. Jones, trans., The Great Qing Code (Oxford: Clarendon Press, 1994), 171-172. Ching Kun Yang, Religion in Chinese Society: A Study of Contemporary Social Functions of Religion and Some of Their Historical Factors (Berkeley, CA: University of California Press, 1961), 40-43. Nanbu County Qing Archive: 20-544-01 to 20-544-05. For a description of Nanbu’s migratory Muslim community during the Republican period, see the section on temples and shrines in the Nanbu County section of the Jialing River Gazetteer. Ma Yiyu, ed.,Jialingjiang zhi (Chongqing: Shangwu yinshuguan, 1946). Nanbu County Republican Archive: 13-2-2007-01 to 13-2-2007-06. Rebecca Nedostup, Superstitious Regimes: Religion and the Politics of Chinese Modernity (Cambridge, MA: Harvard University Press, 2009); Jeffrey Snyder-Reinke, Dry Spells: State Rainmaking and Local Governance in Late Imperial China(Cambridge, MA: Harvard University Press, 2009). Prasenjit Duara, Culture, Power, and the State: Rural North China, 1900-1942 (Stanford, CA: Stanford University Press, 1988).